The Feminist Library is a large collection of Women's Liberation Movement literature based in London and have been supporting research, activist and community projects since 1975. In 2015 The Feminist Library celebrated 40 years of archiving and activism. Totally volunteer run, having created and looked after one of the most important collections of feminist material in all of the UK, and provided an inspiring learning and social space for thousands of people. The iconic red Feminist Library Banners have been used in activism to execute the Feminist Library voice ever since. In December 2018 founder of SLS, Lucy Sanderson was invited by The Rt Hon. Diane Abbott MP to Parliament to attend a supporters circle charity performance surrounded by many people who see the value of the arts and the importance of continuing the conversation about Stop and Search by playwright, Gabriel Gbadamosi. During this period The Feminist Library and all involved (Studio Lucy Sanderson being apart of the design team) were trying to crowd fund using media platforms Instagram and Twitter to gain financial support so the The Library could raise enough donations to move to it’s new home. Inspired by the Qalandiyacamp woman and the villages of Hebron during the first Intifada in 1987 When Palestinian flags were confiscated in protests against the Israeli occupation, which prevented raising any national symbols, women began to embroider motifs of explicit nationalism onto their thobes. These dresses could not be taken from their bodies, and thus became powerful visual expressions of protest. 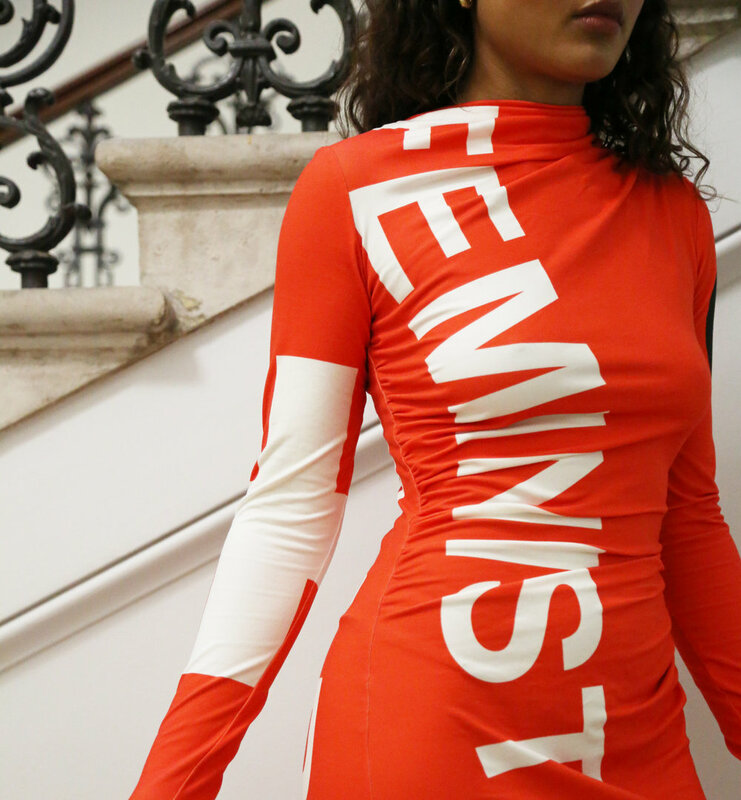 Lucy Sanderson and fashion designer, Alexandra Groover worked through the night to turn one of the Feminist Library activism banners into a dress worn by Sanderson in Parliament to raise awareness and funding for the new premises and hall offered by Southwark Council at the Soujourner Truth Centre, Peckham. Thanks to all the generous donations from supporters, The Feminist Library is now due to open in Spring, 2019.